The father of LSD says he was riding his bicycle the first time he felt the hallucinogenic effects of acid. Could Albert Hofmann, who died at age 102 in 2008, have been the first cyclist to be accused of doping? You could certainly say took the first bike trip. What happens to global bicycle travelers when they've completed their journeys? In the case of two from the British Isles, they take to the sea. Scotsman Mark Beaumont and Englishman Alistair Humphreys are separately embarking on trans-Atlantic rowboat journeys this month. Both are dyed in the wool adventurers and already have completed endurance expeditions off their bicycles. The six-member Atlantic Odyssey rowing team, above, which includes Beaumont, embarked from Tarfaya, Morocco, Monday afternoon. They're seeking to set a world record for the 3,000-mile east-west crossing and become the first crew to break the 30-day barrier. Browsing through the bicycle videos on YouTube this past weekend, I stumbled across this bike that reminds me of those low-riders outfitted with hydraulics. The bike solves the problem for those who like the idea of a tall bike to see over traffic, but don't like the idea of mounting or dismounting it. A standard — but usually unseen and unsung — piece of athletic gear in many sports is the common jock strap. 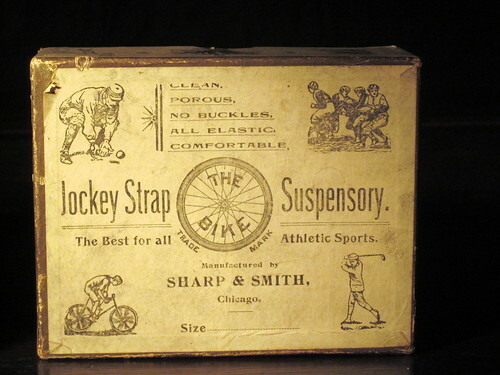 Although I doubt that any cyclists wrapped up in lycra and chamois these days would consider using one, the jock strap was created to support bicycle riders. While visiting a museum on Orcas Island this past week, I stumbled across this antique box for a Jockey Strap Suspensory. It was in a collection of early 20th Century items found in a home's private dispensary. Notice “The Bike” logo and the guy riding his bicycle …. Scores of painted bicyclists made the ultimate sacrifice for their art on Saturday when they bared their skin for the brush and spray-can at the Fremont Solstice Parade. Although the parade celebrates the coming of summer, the temperatures hovered in the upper 50s and a windy drizzle swept off the Puget Sound. In such conditions, even two coats of body paint won't keep a person warm. More than a hundred cyclists participated in the parade this year, in spite of the chilly weather. The painted cyclists have been a fixture at the parade hosted by the Fremont Arts Council …..
Congress voted today to enforce a mandatory recall of 200 million bicycles, effective April 1st. The action, which covers all bicycles sold within the U.S. for the past 10 years, is being taken in cooperation with the automobile industry, the petroleum industry, and the National Manufacturers Association. The surprise vote came as the 182 members of the Congressional Bicycle Caucus, headed by Rep. Earl Blumenauer of Oregon, were out for a spin on the new bicycle lane down the center of Pennsylvania Avenue. They got the news during the dedication of the bike lane, christened the Tony Kornheiser Obstacle Course …. When bicyclists are shooting the breeze about their bike touring exploits, each and every one will have a pretty good dog story. Joe Kurmaskie won't stop there, though. He'll probably tell you about the time he was chased by an elephant. Kurmaskie, aka The Metal Cowboy, is a Portland-based bike travel writer who recently posted a short video about being chased by an elephant while on a charity bike ride in Botswana. The African elephant charged Kurmaskie and his companions briefly one afternoon…. With my email address displayed in the upper right column of every page of the Biking Bis website, I get frequent mail from readers. Usually people offer compliments and suggestions or ask for coverage of their bike tours or websites. But lately, I've received a couple of emails regarding the sexual orientation of the Biking Bis blog. “I'm um not sure how to say this… but your web site name: “Biking Bis” is confusing! I got several hits for this site before finally checking it out. It is excellent. I did not look at it earlier because I thought it was for Gays, Lesbians and Bisexuals, hence the title. How about changing it to “Biking Biz” or even “Bike Business”? There are more bikers than gay people in the world, so hopefully your readership should go up. :)” …..
We all know that Twitter is a great resource for social networking, and it's the one place where you'll always be able to find out what Lance Armstrong is up to on a daily, in not hourly, basis. But I never have been so entertained — and wasted so much time — on Twitter as this morning with suggestions from the Twitteratis of the best bike movies never made.